The F40 was christened in honour of forty years of the Ferrari marque. It was boss Enzo Ferrari's brainchild ... but even he had to get board approval! Once given, the F40 project was passed to stylists Pininfarina. 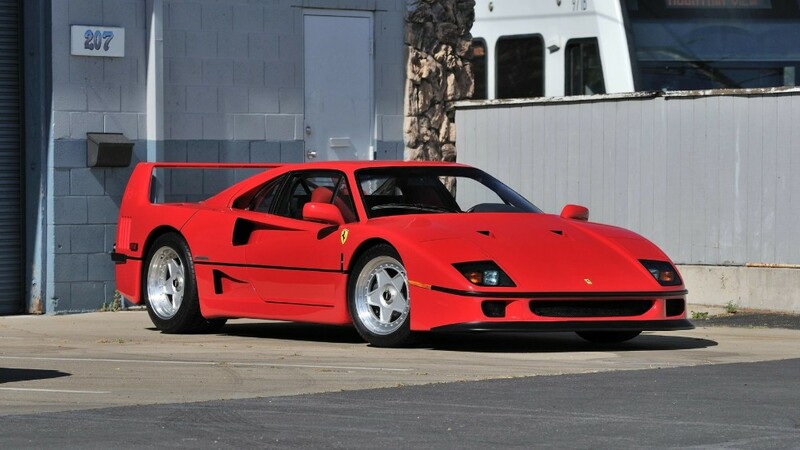 It took only a year for the F40 to go from concept to production. It helped that it was based on the Ferrari 288 GTO. In theory, the F40 was a roadster. It required little modification, though, to go racing. In large part, that was down to its weight - or lack of it. For a car that cost $275,000, there was a noticeable lack of creature comforts. The cabin verged on the spartan! The F40's low weight was due to the composite materials used in its bodywork. They were 20% lighter than their metallic equivalents. That - plus the absence of interior décor - meant the F40 tipped the scales at just 2,425lb. When that was combined with the 288 GTO V8 motor, the results were explosive! The 3-litre twin-turbocharged engine was fitted with sequential ignition and fuel injection. There were silver/cadmium con-rod bushes - and nicasil-coated liners. That all added up to 478bhp. If needed, another 200bhp came courtesy of 'competition mode'. The F40 topped out at 201mph. 0-60 arrived in 3.9s. At the time of its release - in 1987 - that made it the fastest road car Ferrari had yet produced. It remained in production until 1992. Even the standard version featured a raft of competition parts. It had Group C brakes, 3-piece wheels, and removable rear bodywork. Oh, and soft fuel cells. The Ferrari F40's racing pedigree could not have been clearer!